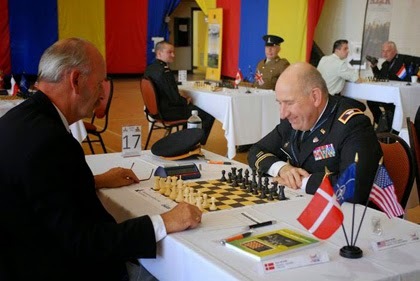 Hello chess blog friends, the NATO chess championship is an annual event and the 2015 edition will be held in Amsterdam. You can find more details at the official website. This photo is from the 2014 edition of the Nato Chess Championship with a nice report by US Chess Federation. Hello chess blog friends, your chess trivia today - wow chess girls in red 'n white - can you name them? Can you also say what is their highest achievement in chess? 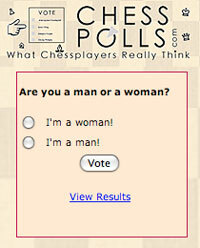 This photo is from the #1 chess portraits database at www.chesspics.com. 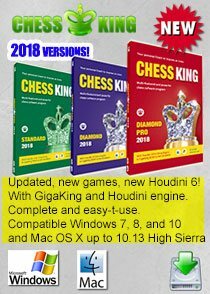 Hello chess blog friends, chess in Australia - a short chess news update via FIDE states Grandmasters from Kazahstan Murtas Kazhgaleyev, Rustam Khusnutdinov and Vasily Papin from Russia were the winners of the Category 8 of the Australasian Masters tournament just completed in Melbourne.The final crosstable can be seen here. In the Australasian Masters IM Norm tournament Kanan Izzat from Azerbaijan was the convincing winner. Full results. Box Hill Chess Club hosted the chess events in Melbourne. The Box Hill and the Canterbury Junior Chess Clubs together form one of the largest chess playing groups in suburban Melbourne. The combined membership of well over one hundred includes some of the best known players in Victoria, such as Victorian champion Bobby Cheng, former triple Australian Champion Douglas Hamilton, present Chess Victoria president IM Leonid Sandler, and Karl Zelesco the nation’s biggest rating improver. The clubs meet at Emulation Hall, 3 Rochester Road, Canterbury every Friday night and most Sundays. Rated tournaments are run throughout the year. New members and visitors are welcome. 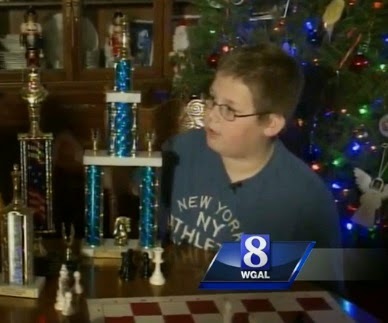 Hello chess blog friends, talented chess kid gets help from the community as doctors say he would lose his vision - Seventh-grader Jonathen Speelman looks like any normal 12-year-old and is a wizard at chess. He even has the trophies to prove it. Three years ago doctors found an incurable eye disorder, retinitis pigmentosa, that will eventually lead to blindness that could happen at any time. Jon's mother says it is painful for her to think about her son going blind. Jon has already learned to read braille and teaches it to other children at a nearby elementary school. But for now, Jon just wants to be a normal kid. Hello chess blog friends, Chess Olympiad u-16 was recently held in Győr, Hungary with a record 40 teams. Indian won the chess olympiad. Here are some nice videos from the event. Enjoy! 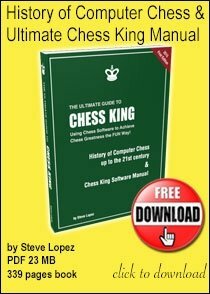 Hello chess blog friends, the Indian national chess championship 2014 concluded recently with GM SP Sethuraman becoming the new champion. He drew his last game to take the title 1/2 ppoint clear of the field. 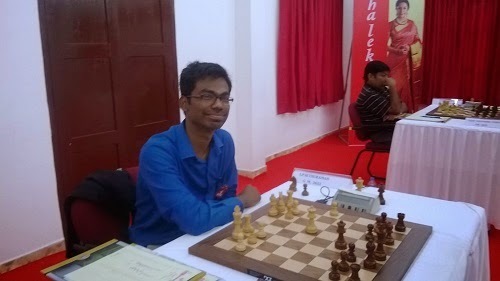 GM Deep Sengupta IM P Karthikeyan scored 8 points, but the former was second on better tiebreak score. This was Sethuraman's third try at the Indian national chess championship and he remained undefeated in the event. Find more photographs at FIDE website. 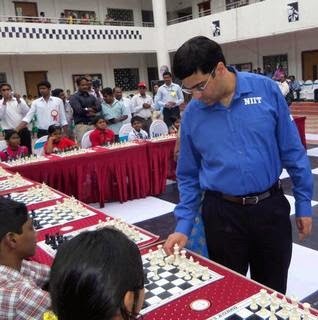 Hello chess blog friends, former world chess champion Viswanathan Anand held a simul for school kids to spread the Christmas cheer. It was a rare opportunity for 10 students of Vriksha Global School at Tiruchengode and 16 students from other schools to take on the five-time world chess champion. Needless to add, Anand won all the rapid games. “It is great playing with the champion,” said the students.“Though it is nervous to play with him, I learnt about confidence move,” they added. The students were from different categories, Under 8, 11, 13 and 16, selected through competitions conducted in the school. Earlier, Anand inaugurated the NIIT Nguru MathLab and Mind Champion’s Academy in the school that will enable students to explore mathematical concepts and theorems using technology tools as well as hands-on-activities using mathematical models. Chairman of the school R. Rajasekaran, correspondent R. Harinivas, Territorial Manager of NIIT Aravind Sadhasivam and faculties were present. In his interaction with reporters, Mr. Anand complimented the State Government’s initiative of introducing chess in schools as it would encourage more students to play chess. “The infrastructure in schools in villages needs to be improved,” he added. 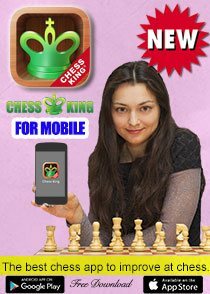 He said that the game has grown in the last 10 years and said that online instruction for playing chess is easily available and asked enthusiasts to actively participate in all tournaments. A relaxed Anand felt that the year was positive with three big wins and expressed hopeful for winning in coming years. “It is good to end the year by winning London Chess Classic. 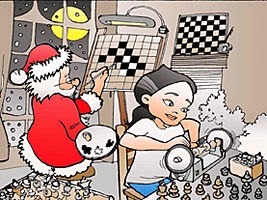 Hello chess blog friends, Merry Christmas with lots of chess fun. 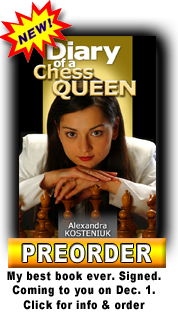 12th Women's World Chess Champion Chess Queen™ Alexandra Kosteniuk is out with Santa to give out the gifts. 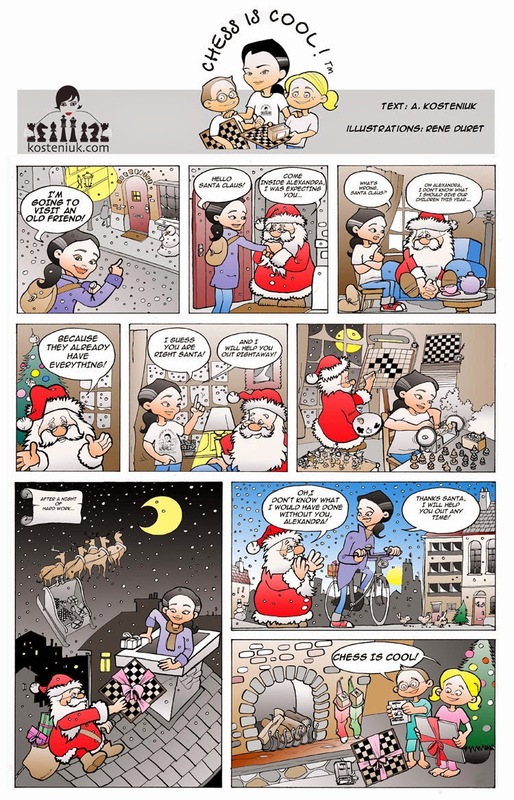 If you know any kids around you, please share with them her chess comic. Remember that giving a chess set or a chess book or a chess program for Christmas is a great idea! P.S. See the full comic below. You can see or download for print all comics in several languages here. You have permission to publish at no cost, as long as you leave the full page and text exactly as it is. 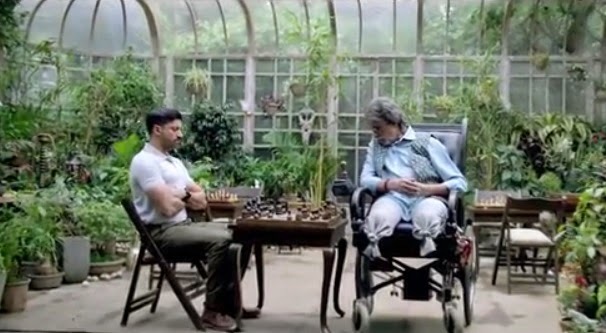 Hello chess blog friends, here's an interesting chess video - the teaser trailer of Bollywood Indian movie 'Wazir'. Wazir, in Hindi, means vice-regent or minister, but in India, when taken in context of chess, it refers to the Queen piece! 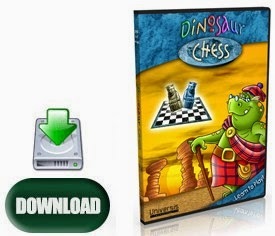 Enjoy the trailer, we will keep you posted on more updates via Chess Magazine Black and White. The movie stars Indian sub-continent superstar Amitabh Bachchan and another young star/director Farhan Akhtar. Hello chess blog friends, former World Chess Champion Viswanathan Anand has said he will be playing more chess tournaments in 2014. Speaking to news agency PTI at a function by his sponsor NIIT, Anand said, he hoped his best was yet to come and "I try to be optimistic." The 45-year-old said he was happy with his performance in the year that is drawing to a close as he won three tournaments, although he acknowledged that in the recent world championship he could not capitalise on the self-created opportunities. "I am happy with this year. I played well in many tournaments. I won three tournaments. I hope the trend continues," Anand, who earlier launched the NIIT Nguru MathLab Plus at a function organised by Kennedy High global school here, said. Anand said he created "more chances" during the world championship, which he lost to Magnus Carlsen of Norway at Sochi recently, but unfortunately could not make use of those. 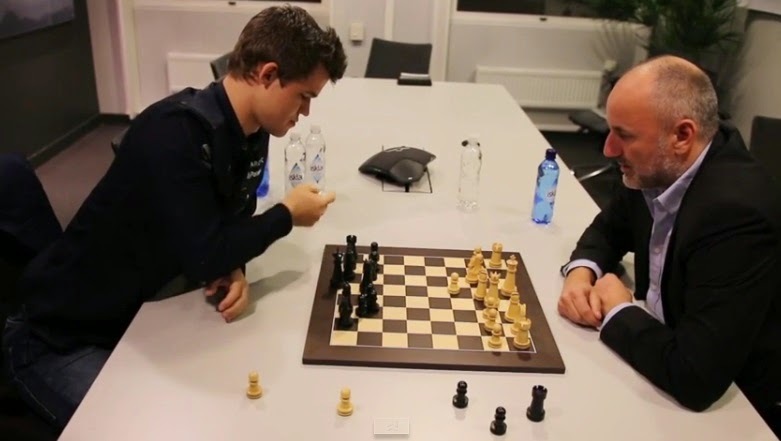 Describing Carlsen as one having a "practical style" Anand said, "He is not someone who spends a lot of time in warming up and playing long openings." Asked if he would like to go into coaching, the grandmaster said he has not thought about it as he was currently focused on playing. "It's very difficult to combine (coaching) with the playing career. And I am still not ready to give that (playing career) up. I am still looking forward for playing for several years. And after that, we can see," he said. Anand, who became India's first Grandmaster in 1988, disagreed with the perception in some quarters that training abroad is better than doing so back home. Expressing happiness over the number of youngsters taking interest in chess, he approved the introduction of the game in education curriculum, saying it would help students perform better in academics also. "Chess enables students to memorise and strategise better," said Anand. It's Chess Summer in Australia! Traditionally in December and January in Australia we are holding many chess events for the players of different strength. At the moment quite a few foreign players are visiting the Green continent and participating in various events around the country. International Master Kanan Izzat from Azerbaijan won the Australian Young Masters competition scoring 6.5 points from 7 games. After 3 rounds in the Cat. 8 Australasian Masters Grandmaster Norm 10 players round robin tournament being held in Melbourne. This event is the strongest round robin tournament ever held in the Victorian Capital! GM Vasily Papin (Russia) and the youngest player in the field 13-years old International Master Anton Smirnov (Australia) leading with 2.5 points. This event is the strongest round robin tournament ever held in Melbourne! By the way Vasily Papin is spending more than a month in Australia and will play in total 62 tournament games in 7 different competition. Kazakhstan Grandmasters Murtas Kazhgaleyev and Rustam Khusnutdinov will play 56 games in Australian soil. Bob Smith (New Zealand) is an early leader with 3 points. Our guests are actively promoting chess in Australia. Vasily Papin has visited school in the bush where all 150 students are participating in a very successful chess program. Here are the list of some notable events in Australia in the coming weeks. January 12-22/2015------Australian Women's Masters (Melbourne). We are welcoming chess players around the world to visit our beautiful country! 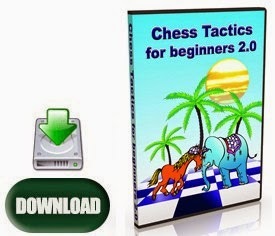 Hello chess blog friends, the Al Ain Chess is off to a great start with some rapid chess. GM Salem A.R. Saleh of the UAE won the Al Ain Rapid Chess Championship yesterday at the Hili Rotana hotel in Al Ain, undefeated with 6 points out of 7 rounds. Seventy players from 17 countries including 25 Grandmasters took part in the one-day precursor to the Al Ain Classic Chess Championship. Salem beat Vugar Asadli of Azerbaijan, Armenians FM Manuel Petrosyan, GM Arman Pashikian and GM Samuel Ter-Sahakyan, GM Rauf Mamedov of Azerbaijan and drew with GM Yuriy Kryvoruchko of Ukraine and GM Mikheil Mchedlishvili of Georgia. After his fourth round loss to Salem, GM Ter-Sahakyan caught up to tie with 6 points for second place as Salem emerged first in the tie break. GM Kryvoruchko finished in third place with 5.5 points ahead by tie break over Mchedlishvili and GM Levon Babujian of Armenia who both scored 5.5 points each. Seven players followed with five points each. Finishing in tie break order were GM Miknailo Oleksienko of Ukraine in 6th place followed by Marin Kravtsiv, also of Ukraine, GM Viktor Moskalenko of Spain, GM Alexander Kovchan of Ukraine, GM Arman Pashikian of Armenia and IM Amierreza Pourrameezanali of Iran. Mokal Amruta Sunil of India won the award for best woman player while IM Omar Noaman received the prize for Emirati player and FM Mayed Alrashedi won best Al Ain player award. 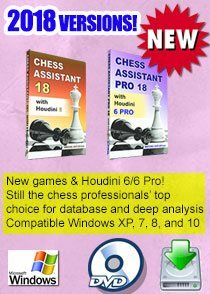 Visit chess-results.com for Al Ain Rapid Chess results and standings and to download games. More players are expected to arrive on time for the Al Ain Chess Classic also at the Hili Rotana hotel. At stake are some $50,000 in cash prizes with a top prize of $11,000 and various category prizes. The standard time control event shall be conducted as a 9-round Swiss System. Two rounds are scheduled on Saturday at 10 am and 5 pm. From Sunday games start 4 pm daily except for the last round which starts 2 pm. All games shall be broadcast live at the alainchess.com web site with photo gallery. Organizing Committee head Dr. Saif Al Nuaimi (left) awarding prizes to the winners of the Al Ain Rapid Championship, from left, runner-up Ter-Sahakyan Samuel, champion Salem A.R. Saleh of the UAE, third placer Kryvoruchko Yuriy, Tournament Director International Organizer Tarek Al Taher, Chief Arbiter Ashot Vardapetian. In front row are, from left, best woman awardee Mokal Amruta Sunil, Mchedlishvili Mikheil, Oleksienko Mikhailo, Kravtsiv Martyn, Kovchan Alexander and Moskalenko Viktor. Hello chess blog friends, chess can be strenuous, particularly if you you play Basque Chess. Beijing World Mind Games chess section concluded with the Basque chess version that has players take on their opponent with both White and Black at the same time over two boards in each round! The Russians seem to be quite at good at this version of hectic chess picking up two medals - Ian Nepomniachtchi picked up the gold in the open section and ChessQueen Alexandra Kosteniuk took the silver in the women's section. “I feel much better now that I’ve won a medal, I couldn’t show my best in the beginning and this was frustrating” stated Nepomniachtchi. 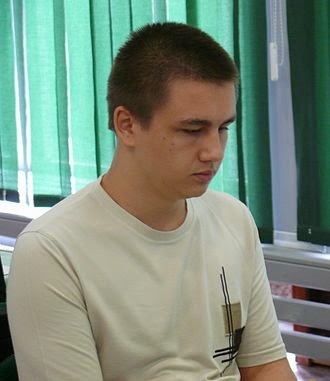 The 24-year-old Russian, living in Moscow arrived at the World Mind Games just after playing in the national championships back home. Koneru Humpy - the golden girl of Indian chess - was pitted against Hou Yifan in the last round and the result could have gone either way, but eventually it was Zhao Xue who got the bronze. You can find lots of photos and videos on the official site. The FIDE website of the SportAccord World Mind Games also has great reports and photographs by Alina L'Ami. 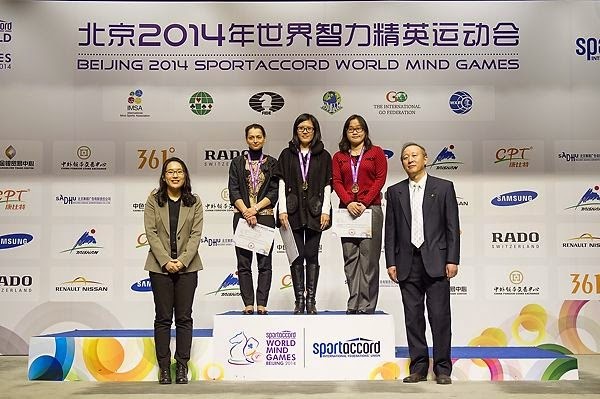 SportAccord World Mind Games is a multi-sport event centred on the gymnasium of the mind and highlighting the great value of the mind sports. The 2014 edition will take place from 11-17 December. As well as the first, second and third editions in 2011, 2012, and 2013 the event includes five mind sports of great popularity and influence worldwide - Bridge, Chess, Draughts, Go and Xiangqi (Chinese Chess). The event is a showcase of some top-level mind games performances with the world's best players. The Cultural and Social Programme is an integral part of the event and through a series of activities, it aims at increasing and improving mind sports' influence and practice in schools. Ever more countries and regions integrate the mind sports as an important part of their education programmes. Mind sports suit well a wide range of people not only in terms of age; these sports can be equally played by people with certain physical disability. The characteristics of the mind games themselves, make these sports particularly appropriate for the use of various resources, such as new technologies. The launch of a new media platform is the springboard for the organisation of online tournament and encourage to practice these sports through the Internet – players from all over the world are able to compete and win attractive prizes! These traditional games, where intelligence, strategy and intuition are protagonists, combined with innovative and modern elements, can create and bring new and unique experiences to a large and highly diversified group of people. 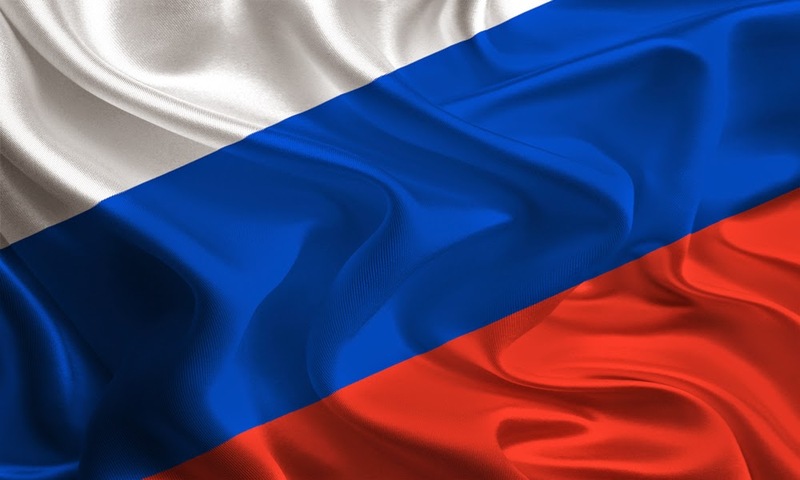 Hello chess blog friends, Russia emerge as the big winners in 4th edition of the SportAccord World Mind Games; China come a close second. 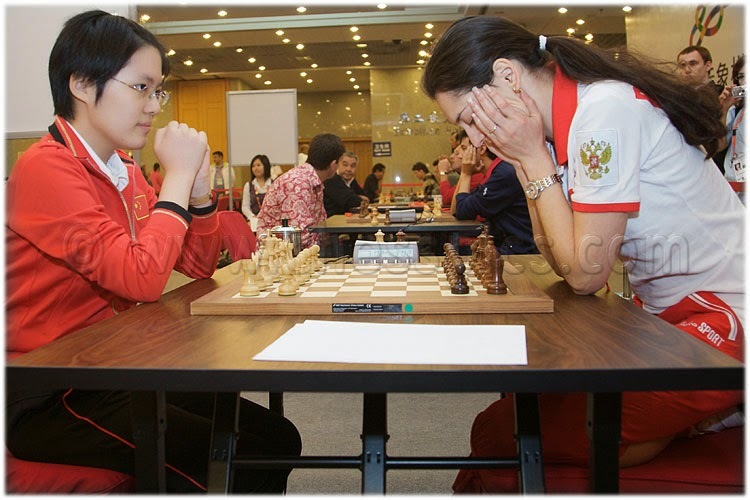 The celebrations of the Russians marked the close of the 4th edition of the World Mind Games 2014, organised in Beijing, China from December 11-17, 2014. The final competition of this year’s event ended with Ian Nepomnianchtchi (Russia) and Hou Yifan (China) being crowned the winners in the men’s and women’s chess basque competitions. With the final medals being awarded, the Russians emerged as the big winners in the whole competition as their players took home a total of 6 gold and 5 silver medals, and 1 bronze medal. Apart from Hou Yifan, Alexander Grishchuk from Russia (chess), Ilan and Ophir Herbst from Israel, Nicola Smith from England, Geir Helgemo from Monaco (all bridge), Mi Yuting and Yu Zhiying from China (both Go) emerged as the big winners in the 4th edition, taking home 2 gold medals each. In total, there were 150 players from 37 countries, who took part in the World Mind Games 2014. There were 14 disciplines across 5 sports on offer, with 24 medal rounds being contested. Hello chess blog friends, GM Yuri Kuzubov of Ukraine is top seed at the Al Ain Chess Tournament to be held from Dec 19 - 26 at the Hili Rotana Hotel. Forty-five Grandmasters and 14 International Masters are among 153 participants from 26 countries for the $50,000 Al Ain Classic Chess Championship. Seventeen of these players are rated above 2600 -- namely Ukrainians Yuriy Kryvoruchko, Alexander Areshchenko, Mikhailo Oleksienko, Evgenij Miroshnichenko and Vladimir Onischuk, Belarussian Sergei Zhigalko, Armenians Tigran L. Petrosian and Arman Pashikian, Ivan Sokolov of the Netherlands, Samuel Shankland of the USA, Constantin Lupulescu of Romania, Mikheil Mchedlishvili of Georgia and Viorel Iordachescu of Moldova. Aside from the host country, the largest contingent is from India with 33 players followed by Azerbaijan with 22 players. National team member GM Rauf Mamedov heads the Azerbaijan delegation while GM Aghijeet Gupta and Vidit Santosh Gujrathi lead the Indian contingent. The tournament will be a 9-round Swiss System. Round 1 will start 6pm tomorrow, 19 Dec.
Two rounds are scheduled 10am and 5pm on Saturday followed by daily rounds starting 4pm. The last 9th round starts 2pm on Friday, 26 Dec. Games shall be broadcast live on the web. At stake are some US$50,000 for the first 20 places with a top prize of $11,000 for the champion and various category prizes. Hello chess blog friends, Indian national chess championship now has S.P. 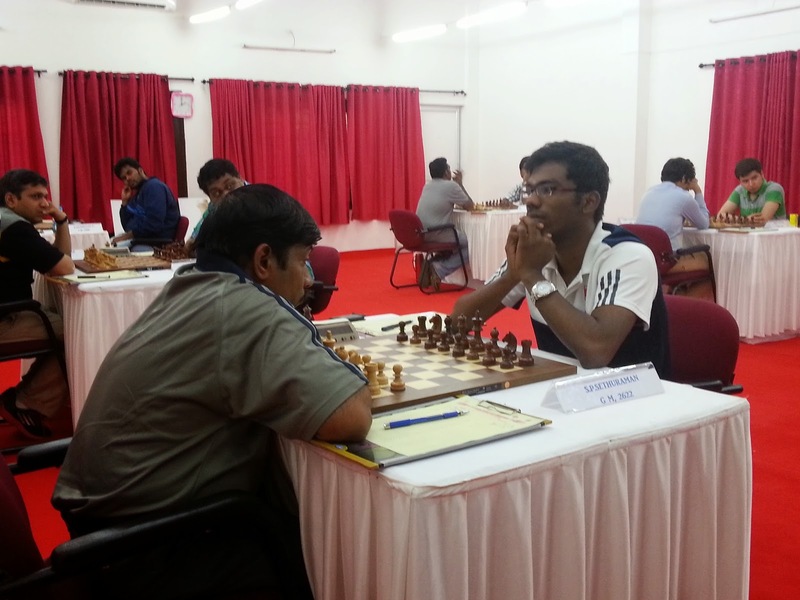 Sethuraman in sole lead after 11 rounds after he drew with Vidit Gujrathi in Kottayam, India. He leads by 1/2 a point. Sethuraman leads with 7.5, and is followed by Deep Sengupta and Sahaj Grover on seven points. In fourth place is Vidit Gujrathi on 6.5 points. All four of them have won world age group titles but not yet the Indian national chess championship. The absence of big stars like Ganguly and Sasikiran has allowed the next generation of stars to play and win the most prestigious National Premier. 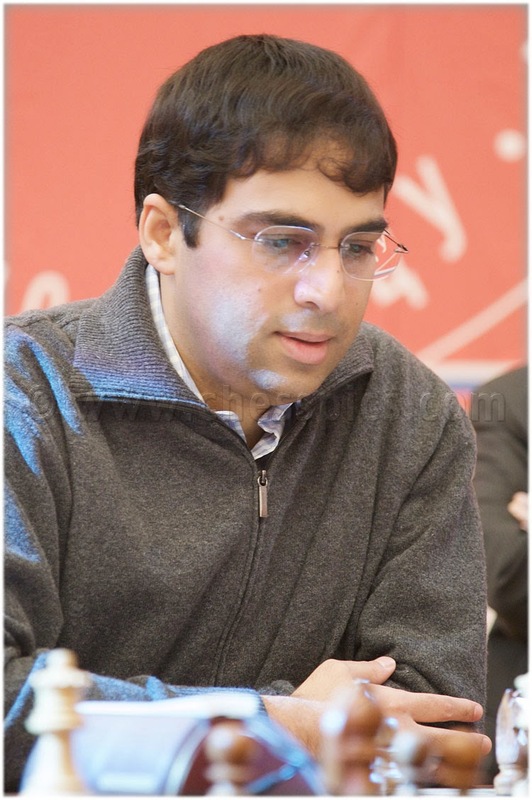 Vishy Anand Chess Trivia: What Trophy is That? 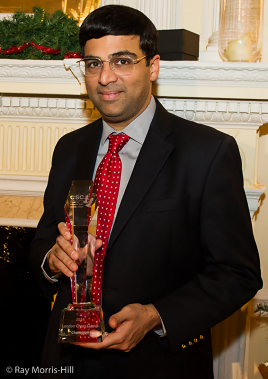 Hello chess blog friends, for all fans of former World Chess Champion Viswanathan Anand of India - the chess trivia question today: What trophy is he holding? 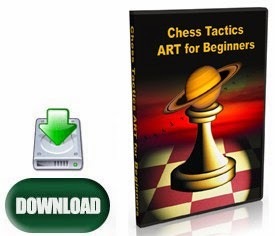 4 Top Chess Downloads for Chess Beginners! Hello chess blog friends, the 90th edition of the Hastings Chess Congress (Dec 29 - Jan 6) has received £6,000 from the Kowitz Family Foundation in conjunction with Chess in Schools and Communities (CSC). This generous gesture is offered primarily to further the interests of junior chess. 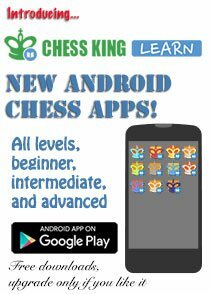 It is intended to inspire young players, to encourage new players and to provide opportunities for existing players to reach their chess potential. In addition the profile of both Hastings Congress and Hastings Borough will be enhanced. £500 will be given to Sussex Junior Chess Association who are holding their annual Junior Congress in Hastings on 4th January 2015. Additions to the Congress programme will appear as soon as confirmed. These are expected to include coaching sessions and additional funding for young players in the Masters. The funding will also help further involvement with local junior schools’ chess activities. CSC is a registed charity whose mission is to give every primary schoolchild in the country the chance to learn how to play chess. The charity was formed in 2010 but has already taught over 40,000 children. This year CSC will deliver chess to 25,000 children in 250 schools across 56 boroughs in England and Wales. The charity provides schools with chess sets, a chess curriculum, teacher training and a weekly visit from a chess tutor.